On November 2nd, Swedish progressive metal legends OPETH will release their new live album Garden of the Titans: Live at Red Rocks Amphitheatre via Moderbolaget Records / Nuclear Blast Entertainment. Captured for DVD, Blu-Ray and Vinyl formats during their performance on May 11th, 2017 at the legendary Red Rocks Amphitheatre in Denver, CO, this concert showcases the unique beauty of both classic and new OPETH tracks. 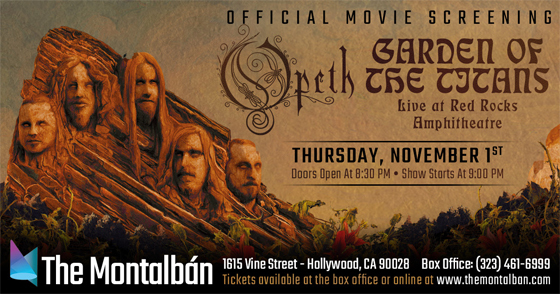 To celebrate, OPETH is offering a one-time screening of the concert at The Motalbán Theater (1615 Vine Street) in Los Angeles. On November 1st, fans can gather to view the historic concert on the big-screen with incredible surround sound. Doors will take place at 8:30 pm and tickets are now available HERE. Always an unstoppable force for uniqueness amid a sea of generic swill, OPETH has been setting the rulebook ablaze, and ploughing a uniquely progressive and exploratory furrow for over 25 years now. Neither conforming nor exhibiting any desire to be restricted to a single genre, OPETH, quite simply, has a time honored tradition of blowing our minds with both class and forward thinking. All these years later, nothing and everything has changed once again with their most recent album, Sorceress. Sorceress was released in September 2016. For the band's first effort for Nuclear Blast via OPETH's imprint label Moderbolaget Records, the group returned to Rockfield Studios in Wales, also home to pivotal releases from QUEEN, RUSH and JUDAS PRIEST, where the Swedes had tracked Pale Communion in 2014 with Tom Dalgety.